These days, it’s tough to talk about content marketing without talking about social media. 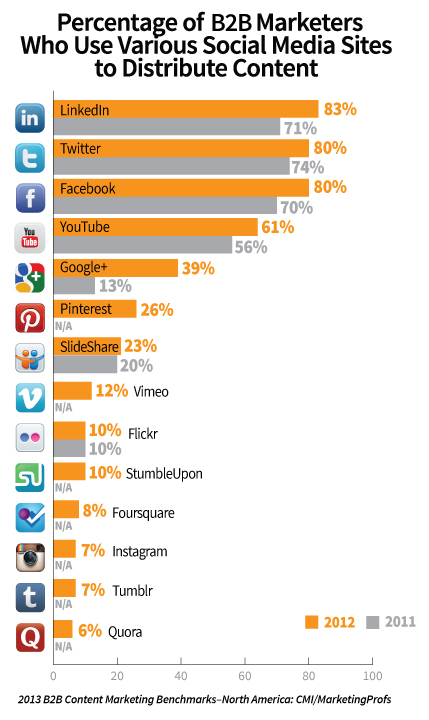 As the Content Marketing Institute/MarketingProfs 2013 B2B Content Marketing Benchmarks, Budgets and Trends research shows, marketers are relying heavily on social media to distribute their content, and there are increases year-over-year. However, is this a good thing? And are marketers doing this correctly? 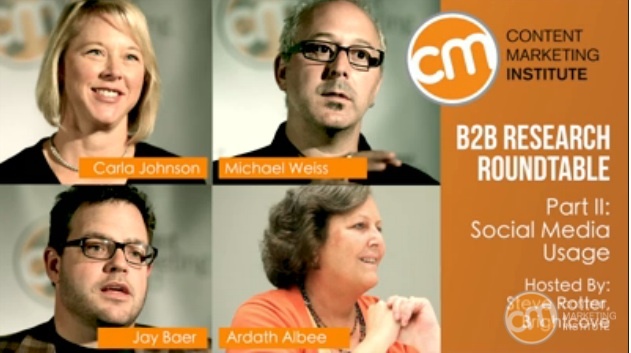 Continuing the B2B research roundtable conversation from Content Marketing World, CMI consultants Carla Johnson, Michael Weiss, Ardath Albee, and Jay Baer talk about the biggest challenges with social media and content marketing strategies. Thanks to Steve Rotter, VP of Digital Marketing at Brightcove, for moderating the conversation. As the consultants mentioned, there are two big challenges with social media and content marketing strategies. Study companies who are executing content marketing well. Coca-Cola is a great place to start, and you can also check out 100 more content marketing examples. Start with your buyer personas. Really understand who is using your content and how they want to get info from you. You want your content in the right format for the social network you are using. CMI’s eBook 58 Social Media Tips for Content Marketing provides suggestions and examples for all of the social channels included in our content marketing research. Check it out! Want to learn more from our CMI consultants? See the rest of the B2B research roundtable series or meet many of them at Content Marketing World.